You can use a Pivot Table to count the number of occurrences in a data entry. This example counts the number of occurrences of a name in a column. This article shows Excel 2016, but this process also works in Excel 2013 & 2010. 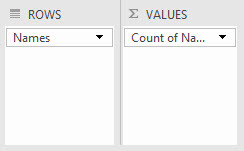 Step 1:Create the list of data in Excel. Make sure the list you want to sort through has a title/label at the top of the column. Step 2:Select any cell in the list that isn't the title/label cell. Step 3:Click the Insert tab and select PivotTable from the beginning of the ribbon. Step 4:Excel will guess at the data range. This is usually correct as long as you don't have blank rows or columns in your list. 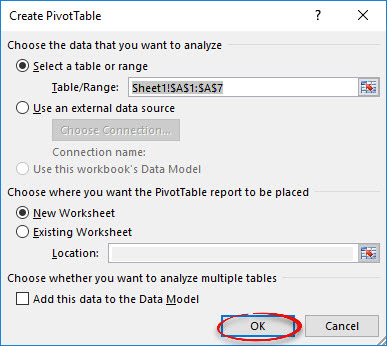 Choose whether you want the PivotTable to appear on the same worksheet or on a separate worksheet. Click OK. Step 5:In the task pane on the right, click and hold on the row field, in this case "Names," and drag it to the Rows section. Release your click. Step 6:Click and hold on the row field again, and drag it to the Values section. Release your click. Because it is a text field, it will count the occurrences of a name. Step 7:The results will show in the PivotTable on your spreadsheet.